Looking for a healthy side dish with lots of Zing? 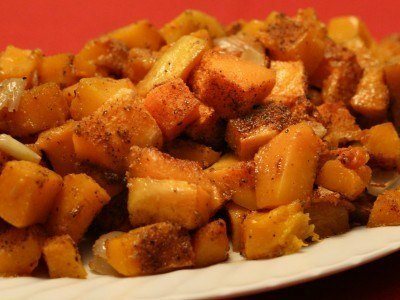 Use this Sensational Recipe to prepare a butternut squash dish that everyone will be raving about! It’s easy to include this healthy vegetable in your diet. 1. Pre-heat oven to 375°F. 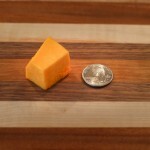 Peel butternut squash and dice squash into 3/4″ cubes. 2. Toss squash cubes with olive oil to evenly coat cubes. 3. Place cubes on a rimmed cookie sheet or baking dish (in a single layer). 4. Sprinkle (liberally) with Sensational Seasonings, Jamaican Jerk Seasoning. 5. Bake for 20 – 30 minutes (the squash will turn golden brown). 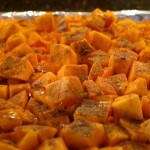 *Serve as a side dish or use as the base for Roasted Butternut Squash Soup. For dicing a butternut squash, you’ll need a cutting board, a sharp, medium-size knife and a tablespoon. First, lay the butternut squash on its side on the cutting board. Then with one cut remove the skin off the blossom end (approximately 1/4″ deep). Now, keeping the squash on its side, cut off a ‘disc’ of squash. Use your spoon to gently scrape away the seeds. Now lay the disc on its side and cut away the skin. Then dice the ring into cubes. Continue these steps as you work your way up to the stem end of the squash. Sensational Seasonings include Pork Rub, Chicken Seasoning & Jamaican Jerk Seasoning. Our Pork Rub is completely salt -free (this comes in handy when brining, so you don’t “double salt” or if you are restricted to a salt-free diet). Our Chicken Seasoning is a ‘low-salt’ seasonings while our Jamaican Jerk Seasoning is ‘very low-salt’. These seasonings meet FDA guidelines for salt-free, low-salt and very low-salt classifications. Reducing the salt content of our seasonings allows you to get more flavoring from the seasonings without over-salting and lets you control your salt use.